deBonton wishes you une bonne rentrée! The deBonton 2nd Grab Bag will be coming out on October 10th in stores and on iTunes. A compilation of 7 pop originals. deBonton is going to start a residence at the new Social Club and bringing Chromatics on a Friday night in December. deBonton is going to organize small weird events for those who really pay attention. deBonton has free music to give away: The Drums - Forever and Ever Amen (Thieves Like Us Remix). For it's official european physical release, Thieves Like Us - Again and Again is becoming a double album and will be in French stores the 15th of November. Again and Again (2CD Remix Edition) will include an album of remixes and dance mixes with the participation of pretty people like Nite Jewel, Minitel Rose, Cécile, Rikslyd, Sundance, etc. Thieves Like Us - Video + Free EP! And like Robin Hood, Thieves Like Us are giving back: here is the free âÂÂÂÂForget Me NotâÂÂÂÂ EP including the original song, their brand new dance mix of it, and their strange mashup version of âÂÂÂÂSilenceâÂÂÂÂ, with Ludacris rapping all over it! Counting the remixes, thatâÂÂÂÂs seven free tracks in all, downloadable in a tidy package here. You can also thank them by BUYING their new album "Again and Again" on iTunes, in CD format, or with a limited edition T-shirt! Thieves Like Us - Forget Me Not (single) - OUT NOW! 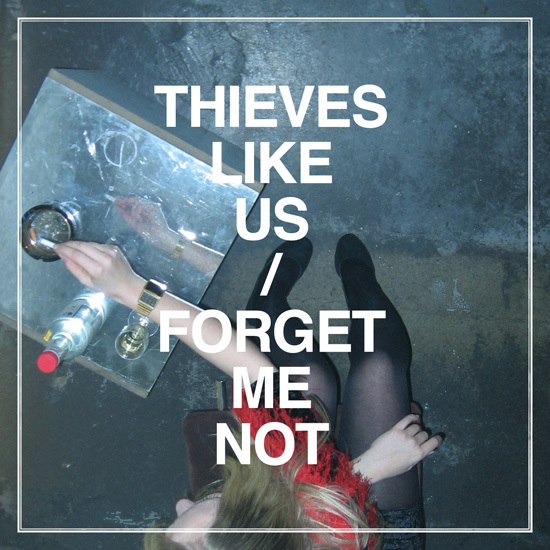 Buy "FORGET ME NOT" by THIEVES LIKE US on iTUNES! Thieves Like Us - Forget Me Not REMIXES on HYPEM.